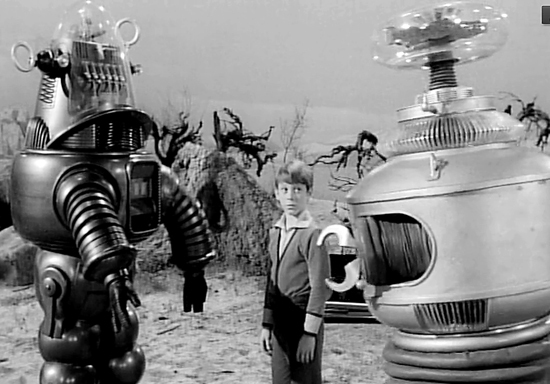 OK, Lost in Space is Cheesy, I mean really cheesy, but honestly what kid my age didn't love that robot. And Robbie - he was the ultimate! Now Forbidden Planet was about as far away from Lost in Space as one could get, but these two robots formed the core of a young boys vision about what a robot was supposed to be. 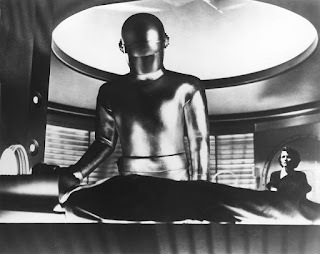 Toss in Gort, a few odds and ends from Creature Double Feature and you have the foundations of my vision of the future. I'm not ignoring Rotwang's creation in Metropolis, she/it was the definitive elegant robot for a long time, but elegant was not what came to my mind when I thought robot. Clanky, Metal, Lurching, and perhaps Malevolent, but not elegant. So when I sit down at the bench in The Robotorium this is the history that drives the aesthetic I am going for.